Onchain and NEO are not only succeeding in their vision, but they are set up to thrive within the regulations of the Chinese government. There is a 50,000 USD yearly cap on moving money out of China without special permission. People found a loophole in this system by buying cryptocurrency and easily moving funds and accessing them anywhere in the world. The Chinese government tried to close this loophole through the banning of online exchanges. The government was also worried about the levels of speculation, thinking back to their recent stock market crash. After China banned exchanges and ICOs, interest in cryptocurrency didn’t simply roll over and die. People moved to a p2p model, making local transactions, often referred to as the “over the counter market.” Here’s a look at the change in volume on localbitcoins around the time of the bannings. People would also organize trades on WeChat, the most popular chatting service in China. This was especially convenient at first since users could use WeChat Pay to send each other fiat currency. Government monitoring of WeChat led to increased popularity of the encrypted chatting service Telegram. China then banned Telegram. It’s unclear if the new p2p models are legal in China, but there has been no direct intervention as of yet. Realistically, it’s not feasible to stop all cryptocurrency trading. Residents of China can also hop on the train into Hong Kong to obtain cryptocurrency. Over 100,000 Chinese tourists travel to Hong Kong every day. They can buy coins from any of the large exchanges or use one of the many BTC ATMs. It’s no wonder why the Hong Kong BTC ATMs frequently have large lines. The Chinese government has a history of protecting local companies willing to cooperate with regulations. Playing by China’s rules has proved fruitful for several tech companies. You won’t find Google, Facebook, Twitter, WhatsApp, Uber, or Amazon in China. Instead, you see the success of Baidu, RenRen, Weibo, WeChat, Didi, and Alibaba. WeChat, for example, has over 1 billion accounts registered. NEO and Onchain are positioning themselves to be the next big names on this list of tech giants. While not exactly friendly to Bitcoin, the Chinese government does actually support the development of blockchains. The Ministry of Industry and Information Technology (MIIT) of the People’s Republic of China, with the help of Onchain and other companies, explored several areas where blockchains can increase efficiency and prevent fraud. The government believes supply chains, assets, finance, welfare, and identity management can all potentially benefit from the use of Blockchain Technology. The government has even experimented with the idea of its own national cryptocurrency. It’s obvious that Hongfei anticipated the future demands and requirements of the Chinese government as these are all areas that Onchain is hoping to tackle with its custom and flexible Distributed Networks Architecture. This is your last chance. After this, there is no turning back. You take the blue pill – the story ends, you wake up in your bed and believe in whatever altcoin you want to believe. You take the red pill – you stay in China and I show you how deep the blockchain goes. NEO was designed from a technology standpoint to be able to comply with regulations and work within the system. Bitcoin was designed with decentralization as a focus. While there are advantages to decentralization, it can lead to disagreements on the direction of the coin and slow implementation of new ideas. Decentralization is not the immediate goal of Onchain and NEO. Hongfei believes the centralization is worth it, in the beginning, allowing them to implement changes quickly. The NEO blockchain confirms transactions in a relatively centralized, but unique way. Rather than using proof of work or proof of stake, NEO uses Delegated Byzantine Fault Tolerance also known asdBFT. In this system, holders of NEO elect nodes to confirm transactions. To become a node, you must have a computer reach certain technical requirements, stake 1000 GAS coins, and then become elected by NEO holders. All 12 active nodes currently provide free transactions. The NEO holders are certainly more likely to vote for people that promise free transactions. Once you are elected as a node, you might be randomly selected to confirm the transactions on the blockchain. If over 66% of the other nodes agree with your ledger, the block is confirmed. If less than 66% agree, another node is selected to propose transactions that should go on the block. This process continues until a consensus is reached. NEO holders would most likely vote out nodes consistently failing to propose correct transactions. The Delegated Byzantine Fault Tolerance makes it clear which transactions are confirmed on the blockchain at all times. In The Matrix, we learned there is no spoon, but they forgot to mention there are no forks either. Unlike Bitcoin or Ethereum, which often fork until reaching a consensus, the NEO blockchain cannot fork. The lack of forks is essential to Onchain’s goal of digitizing assets such as stocks, bonds, and digital identities. If companies want to digitize regularly traded assets, it must be clear who is the owner of the assets at all times. Onchain is working hard to spread their blockchain technology to private and government institutions. Here is a slide from a recent presentation by Hongfei. This project was “initiated by Guizhou Far East Integrity Management Company” and is based on the Distributed Networks Architecture. Onchain is helping build a blockchain to keep track of and manage identification. Onchain is applying the blockchain in financial institutions. It’s already working on a chain for Everbright Securities, a large securities brokerage in China. Onchain helped develop a blockchain for the digital storage of enterprise emails as evidence. No one can delete or tamper evidence once it’s in the blockchain. Onchain developed an email repository system for Alibaba to allow users to store important data or emails. This has several applications, including saving emails for the use of judicial proceedings. The following diagram outlines many of the different uses for the Distributed NetworkArchitecturee. Onchain would like to continue building partnerships in China, eventually moving fiat and identities onto blockchains. 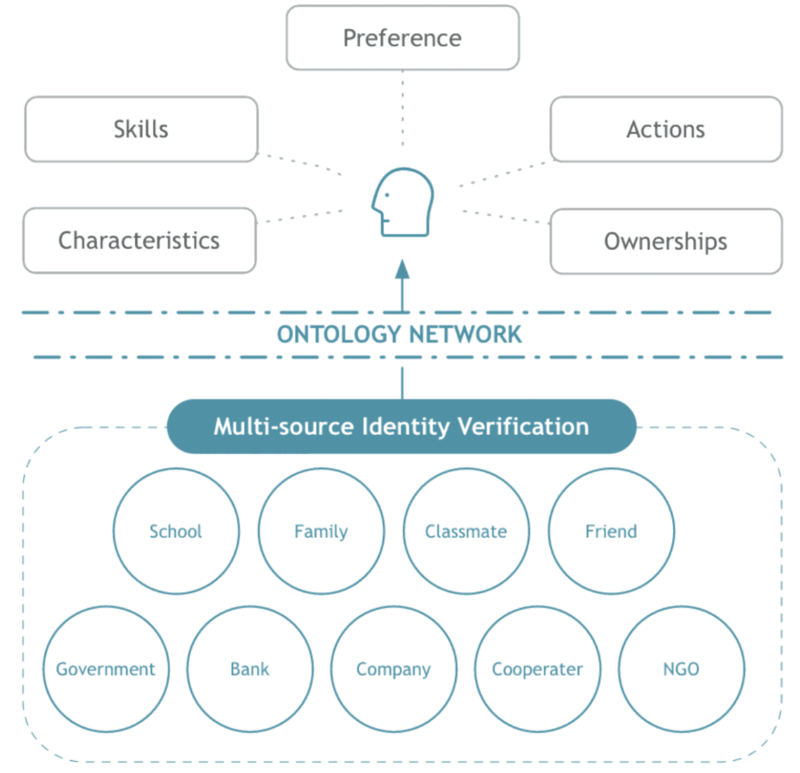 They are starting a new blockchain called Ontology focusing specifically on identities. Hongfei would like to attach data to ID’s, such as universities and working experience. Authorization on ID’s would be the ability to authorize people to view your information, such as your finances when applying for a loan. These next diagrams show how Ontology would achieve the goal of truly spreading blockchains across China. These digital identities also tie into Onchain’s and NEO’s desire to be compliant. China cannot effectively monitor these platforms if they don’t know who is using it. All of these public and private blockchains created by Onchain, including Ontology, will eventually be able to connect to NEO. The Ontology token sale will accept NEO tokens. “NEO will be the primary digital assets service provider for clearing and settlement on Ontology.” Ontology wants to become the government compliant connection between businesses and NEO. While some worry that Ontology will compete with NEO, it seems that the developers have every intention to create synergy between the two. When the Ontology network wants to hold an ICO, they will be able to through the NEO platform. Currently, an ICO would cost you 50,000 USD worth of GAS. This means we will see more serious and less frequent ICO’s on the NEO platform. This runs in sharp contrast to a recent joke Ethereum ICO called the Useless Ethereum Token (UET), which promised to steal your money and give you a worthless token in return. The creator begged people not to buy it and insisted he would just take their money and buy expensive electronics with it. Of course, people still spent over 300,000 USD on UET. NEO seems to have such a bright future that it has even caught the attention of Litecoin founder Charlie Lee. Onchain is clearly executing on their ambitious plan to create an entire ecosystem of standardized and connected blockchains in China, all of which will be able to connect to the already successful NEO ecosystem. We could say the future of NEO is reminiscent of a conversation from The Matrix movie. Paul is a crypto-enthusiast, strategy game world champion, mathematician, and educator based in Taiwan. When he’s not drinking coffee to fuel these interests, you can find him on the way to a coffee shop.